Cairo International Jazz Festival 2012 will be on 15th till 17th March,hosted by Sawy culture Wheel in Zamalek. The festival will host a group of outstanding artists from Spain,Austria,Portugal,Holland,USA,Japan,Syria,Australia and of course Egypt. This year’s festival motto is “Egypt is ok” – Misr Bekhir- as an initiative and contribution to send a message with a touristic side to assure the world that Egypt is capable of overcome the difficult times and attract tourists. The festival will host also musical workshops and educational programs for kids to introduce them to the Jazz culture and give the young Egyptian musicians the chance to communicate with a group of the best performers who will be showing a wide array of diverse Jazz styles. 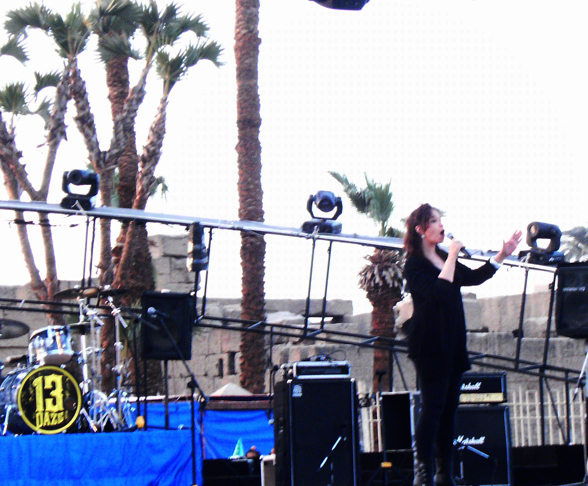 Cairo Jazz club will be hosting additional shows daily during the festival. The wonderful Michelle Rounds who performed under the shadows of the glorious Luxor Temple on 26th February 2011 will be performing during the festival. U.S. 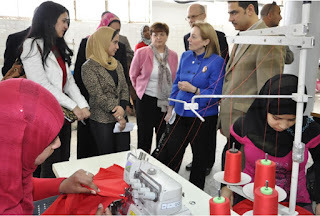 Ambassador to Egypt Anne W. Patterson launched today a vocational training program for women through the Pink Cotton project in El Siouf, Alexandria. Pink Cotton, a project supported by the U.S. Agency for International Development (USAID), will provide job skills and literacy training for female employees. 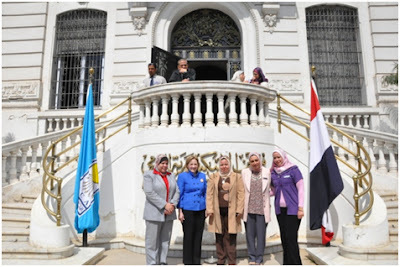 The project officially launched today in celebration of International Women’s Day. The Pink Cotton training program aims to provide job-skills training for 100 women in apparel manufacturing. In addition, the company plans to partner with other manufacturers to expand training to their employees in the apparel industry. A literacy training program will also be offered to the women. U.S. Ambassador to Egypt Anne W. Patterson visited the National Museum in Alexandria on March 8, accompanied by Ms. Suheir Amin, director of the five museums across Alexandria, and Ms. Nadia Khader, director of Alexandria National Museum. Dr. Mohamed Ibrahim, Minister State of Antiquities, met Dr. Yasser El Shayeb (Director of the Center for Documentation of Cultural and Natural Heritage- CULTNAT) to discuss the ideas of co-operation between them concerning documentation and preservation of the archaeological and cultural heritage. They reviewed during the meeting the possibility of implementing a project to portray three-dimensional images of the Egyptian antiquities by using laser to produce holograms on screens or in the open air without the use of display screens to promote for the less visited and known sites such as Hibs Temple, near Khargha Oasis in the western desert, both nationwide or internationally through the international travel markets which could be a factor to attract tourism and increase national income. 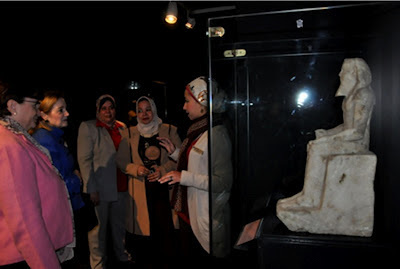 The minister also asked Dr. Yasser to contribute in implementation of Heritage display panorama in Sharm El Shiekh Museum (Under construction) through the Heritage documentation centre’s modern technologies to introduce the Egyptian history and civilisation through the ages. Dr. Yasser welcomed the idea and promised to implement the Culturama in one of the halls allocated for this purpose in the museum. CULTURAMA, is a Cultural Panorama over nine screens, the first ever patented 9-projector interactive system. 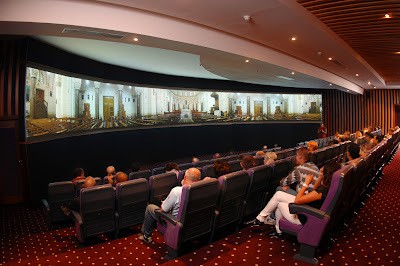 It is an innovative harmonized mix of cultural and natural heritage information, using an informative and attractive multimedia program and the latest display technology.